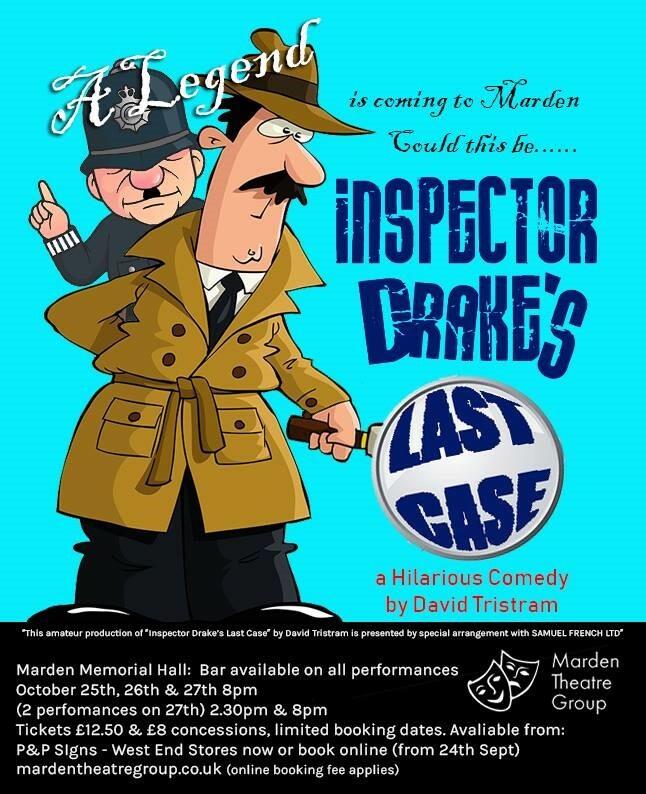 Marden Theatre Group’s next production will be Inspector Drake’s Last Case with performances at the end of October in the Marden Memorial Hall. Standby for the ultimate Agatha Christie spoof, as Inspector Drake, ably hampered by Sergeant Plod, interviews a colourful confusion of characters. David Tristram’s first-ever play is riotous fun from opening curtain to outlandish denouement. No one could have foreseen the strange events that took place one dark evening at the home of Mrs Gagarin. We see her taking a stroll. Next she screams, “Who is it? Oh, it’s you!” Next a gunshot! It’s up to the world’s greatest detective to solve the crime. But, in the words of Sergeant Plod, “don’t believe everything you see …”. Come and see Marden Theatre Group create this fantastically entertaining play. Email us at info@mardentheatregroup.co.uk with any queries. Tickets can be purchased from local businesses and also online (booking fee applies). Here is our Eventbrite page for online tickets.